13 gauge aluminum shelf, 10 gauge caster mounts. 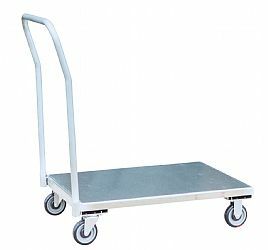 1-1/4" removable aluminum handle with smooth radius bend, 30" handle height above platform. Platform height - 8" (add 4" for N8 casters).